If your commercial awnings need rejuvenation, here are some reasons why you should consider awnings for hotels and resorts. No matter the weather, there are all sorts of benefits for your business. Summertime is peak business season for hotels and resorts. If your commercial awnings need rejuvenation, here are some reasons why you should consider awnings for hotels and resorts. No matter the weather, there are all sorts of benefits for your business. Your guests will also benefit. If you would like to learn more, please read on. More Shade: In the summertime, the sun will be stronger. Commercial awnings can provide more shade, especially at the beach or other sunny areas. Guests will be relieved to be able to stay out of the sun long enough to cool down. Commercial awnings are also great for poolside areas. Swimming and sunbathing become a lot more enjoyable when guests can relax in the shade with a cooling drink. Against Winter Weather: Although summer is when hotels and resorts are at their busiest, the winter is a busy travel season as well. Even though it’s only June, it’s never too soon to start thinking about the end of the year holidays. Snow and ice can be kept off your walkways and other foot traffic surfaces. Thus, commercial awnings can help make the grounds of your property safer for everyone. When There’s Rain: No matter the season, there will be rain and storms. Awnings not only add curb appeal but protection against the elements while your guests attempt to load and unload. Repeat Business and Word of Mouth: When guests enjoy themselves or have an incredible time, they are going to want to come back. Also, guests will likely return with more friends and family in tow. Even if they don’t they can spread positive reviews through word of mouth and the Internet, which will drive up attention and business for your club or resort. Save Money on Energy Bills: In the summer, heat and humidity are going to demand higher air conditioning costs. Air conditioning and other cooling methods will have to work harder. 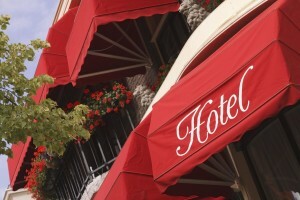 Consider using commercial awnings to help improve comfort for guests and employees. More shade near the entrances and exits can also prevent too much heat from entering the building.